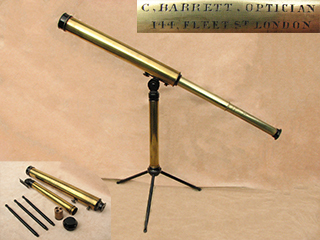 Signed 'C BARRETT OPTICIAN, 144 FLEET ST LONDON', this 19th century telescope was made by Charles Barrett (son of instrument maker Edward Barrett). Dating to around 1895 (before the company was renamed to C Barrett & Co in 1900), this is an impressive table top 2 draw refracting telescope with integral stand and end cap. Unscrewing the base of the stand reveals three brass legs within the hollow tube, the legs in turn screw into the base fitting to form the tripod which is then attached to the telescope main barrel with two screw fixings. The telescope is fully functional with a smooth but firm draw action, and aside from a couple of minor dings on the tubes and barrel is in very good condition. All optics are in clean undamaged condition, and the 40mm visible diameter objective lens gives a clear image which focuses easily to a magnification of approximately 25x. There is a parallel dust slide to the eyepiece, but is missing its little external pip. Measuring 18.5" high (480mm) when attached to the stand, 28"(720mm) fully extended length and 15 ¾" (400mm) when closed, this is a substantial instrument weighing 1.6kgs. A classic antique telescope which is not only functional, but also a fine display piece. Better known as a prolific maker of field telescopes for the British Army during both WW1 & WW2, Broadhurst Clarkson were not known for producing naval telescopes, so this is a particularly rare example of a 20th century single draw Officer of the Watch telescope. Engraved 'BROADHURST CLARKSON & CO, LONDON, OFFICER OF WATCH, x 18' on the first draw, it probably dates to the post WW2 period and was likely made for retailing in one of the more prominent Naval outfitters of the time. In very good condition, the fittings retain all of their nickel plated finish, and the draw tube action is firm and smooth. The main barrel is covered in its original dark brown leather stitched cladding, which is also in very good condition with no scuffing, and unbroken stitching including the strap cleat that would have retained the leather end cap which is no longer present. All lenses are clean & free of any damage, producing a very clear and sharp image of 18x magnification through the 35mm diameter objective lens, and the eyepiece has an integral swivel dust cover. Weighing just under 750 grams, measuring 18" closed and 25.5" fully drawn, there are only a few very minor dings on the draw tube, none of which affect functionality but I mention them for accuracy. A powerful 3 draw leather clad field telescope by Broadhurst Clarkson, which is fitted with an additional pancratic draw tube, enabling the power to be increased at will from 25x to 40x in 4 stages of 5x. This is a great advantage as objects not clearly seen can be readily observed with the 40x setting. The tapered main barrel is covered in stitched brown leather in very good condition and with all stitching intact on the cladding & end caps. 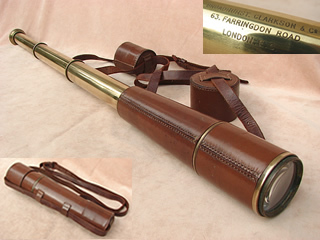 There are two protective leather end caps plus a shoulder carry strap, and the draw tubes are bronzed brass still retaining all of their anti glare coating, showing that this scope has probably had very little use. Engraved 'BROADHURST CLARKSON & CO LTD, 63 FARRINGDON ROAD, LONDON E.C. ', and measuring 10.5" closed, 34.5" fully drawn with sunshade extended, the object glass has a visible diameter of 55mm which delivers a clear well focused image. The overall cosmetic condition of this telescope is very good as can be seen from the photos, is fully functional with clean undamaged lenses, and dent free draw tubes which have a smooth but firm draw action. A substantial telescope yet weighing just under 1.3kgs it's ideal for spotting or stalking on the hill. Eight draw telescopes are exceptionally rare items, and measuring only 5.75" (145mm) closed, the eight draws extend this particular example to an impressive 29" (738mm). Probably made in the latter part of the 19th century this compact yet powerful telescope delivers a clear focused image of approximately 30x magnification through its 40mm objective lens and is deceptively heavy at just under 700 grams. Unsigned but clearly a quality piece in very good condition, the nickel silver draw tubes still have a firm draw action and the leather clad main barrel has unbroken stitching, albeit with some age related scuffing. The eyepiece cup has an internal swivel dust cover to protect the inner lens, and it comes in a modern drawstring pouch for protection. This telescope is the highest power portable ever made by Broadhurst Clarkson and was rebranded DOLLOND LONDON on the first draw for retailing by Dollond. Specially designed to give very high magnification it was designed primarily for the export market, particularly Australia and New Zealand, and the instrument has 4 main draw tubes with an additional pancratic tube which enables the power to be be increased at will from 30x to a very powerful 60x, hence its name, 'The Super 60x Telescope'. Made in varying sizes of objective glass, this is the 3" version which was the largest of the range, and not only gives a wider range of view, but also gathers more light making the image brighter in low light levels. The body is covered Brown Calf, with caps & carrying strap, and is of impressive proportions, measuring 12" closed & 42" fully drawn and weighing 2.4kgs. It's in full working order with a clear sharp image and also in very good cosmetic condition as can be seen from the photos retaining all its anti glare bronzing, with no dents it's clear this telescope has had very little use. All buyers please note: due to weight, delivery will be by courier and therefore it is very important that a contact telephone number be entered through the shopping cart at checkout stage! A vintage 2 draw field telescope, complete with its original leather covering and end caps. Engraved on the first draw 'Britannic, B.C & Co. Ltd. Made in England' and made by Broadhurst Clarkson, this is a nice medium size field telescope ideal for spotting. In very good condition all round with dent free tubes, all the optics are also in good undamaged order, and the objective glass has a visible diameter of 40mm which delivers a clear, sharp image of 20x magnification. The leather cladding is also in very good condition with all stitching intact, and matching shoulder strap. Measuring 24.5" fully extended with ray shade, 10" closed, and weighing just under 900 grams, a very practical telescope for use on the move, and fully disassembles for easy access to internal lenses. This 19th century 3 draw leather clad marine telescope is in very good condition with all stitching intact on the leather cladding. The brass draw tubes still have a firm draw action, albeit with the odd ding and some age tarnish, not uncommon in telescopes of this age. Protected by a removable brass end cap with external slide & a sliding rayshade, the 35mm diameter objective glass produces a good focused image of approximately 15 - 20x power. The eyepiece is also protected by an external slide built into the cup, and the telescope disassembles fully for access to the interior lenses. A substantial ships telescope of impressive proportions, it measures 11.5" closed and 35.5" extended, and weighs just over 1.2kgs. A classic unsigned antique telescope which is not only functional but is also a nice display piece. This mid 20th century, single draw Officer of the Watch Naval style telescope is signed, 'COMMODORE 20X, ENBEECO, LONDON. Made by Newbold & Bulford under their brand name ENBEECO (NB&CO), its made in the style of the distinctive British Naval Officer of the Watch telescopes but with a screw on rayshade instead of the traditional sliding type. Constructed in chrome plated brass with a stitched leather cladding on the main barrel it is well made and does deliver a powerful clear image through the 30mm diameter objective lens. It's in very good cosmetic condition throughout, including the leather cladding & has a smooth firm draw action with no dents. It measures 23.5" fully extended including sunshade, 17" closed, and weighs 530 grams. In good working order, it's also practical for regular use. This 3 draw leather clad telescope is engraved 'NEGRETTI & ZAMBRA, LONDON' on the first draw and was made for spotting in the field. The dent free brass draw tubes still have a smooth, firm draw action and retain much of their original non reflective finish. Measuring 31.5" (795mm) fully drawn, 10" (250mm) closed, the leather cladding is in sound condition with all stitching intact, including the protective end caps and matching shoulder strap. All lenses are in undamaged condition, with the 40mm objective glass delivering a clear well focused image. Weighing just over 1 kg, this is a quality field telescope in good cosmetic condition by one of the most prestigious instrument makers of the 19th & 20th centuries. This classic 2 draw mahogany & brass Naval telescope dates to the first half of the 19th century and is signed 'G. Bradford, Maker, 99 Minories near Tower Hill, London'. George Bradford is recorded as working between 1817 to 1851, his trade card describes him as 'Real Maker of Mathematical Instruments', and the style of this ships telescope would suggest circa 1830. Optically very good, all 5 lenses are undamaged, producing a clear image to around 15x - 20x magnification. An antique telescope in very good condition all round, the brass draw tubes are in good order with no dents and still retain a smooth firm draw action, the polished mahogany barrel is also in fine condition with no splits or cracks. Weighing just under 1.2kgs, it measures an impressive 39" fully extended with sun shade, 15" closed, and has sliding shutters at each end to protect the 40mm objective lens and eyepiece. This 3 draw leather clad tapered barrel telescope is engraved 'Quick Focus 22/100 Spotter, J H Steward Ltd, LONDON'. Measuring 32.5" extended, 10.5" closed, the 50mm objective glass delivers a bright sharp image of 22x and focuses from around 10metres to infinity. It also has a unique twist eyepiece for quick focusing, hence its name. All lenses are in good undamaged condition, and the leatherwork is also in fine order, including the protective end caps with all stitching intact. The draw tubes are dent free and have a smooth draw action. Originally made for use as a target spotting scope by rifle clubs, it's ideal for every day use, with all the attributes of a good stalking telescope, and weighing just under 1.5kgs. The London telescope maker Thomas Harris (1750–1827) formed a partnership with his son William in 1806. They advertised as opticians to the Royal Family and in 1817 located their workshop in Great Russell Street, across from the entrance to the British Museum until 1846, when the business moved to High Holborn. This 3 draw mahogany and brass marine telescope is engraved 'Tho's Harris & Son, Opticians Oppo' the British Museum, LONDON' in ornate flowing script on the first draw, and dates to the period between 1817 and 1846. Weighing just over 750 grams, it measures 31.75" (810mm) fully extended with sun shade, 9" (230mm) closed, and has sliding shutters at each end protecting the 40mm objective lens and eyepiece. An early antique telescope in very good condition all round with only a couple of minor dings on the brass draw tubes, it delivers a clear well focused image. A rare example of a single draw Officer of the Watch Naval telescope signed, 'HEATH & Co Ltd, Makers to the Royal Navy, NEW ELTHAM, LONDON, 2266'. Heath & Co are recorded as working from 1845 to 1937 when the buiness was incorporated with W F Stanley, and this telescope probably dates to the 1920's. The telescope is of nickel plated brass construction and measures 29" fully drawn with the ray shade extended, but is quite unusual in that it has an additional pancratic tube to provide variable magnification in 4 stages of 15x, 18x, 21x & 24x. Whilst this is not uncommon for field telescopes, its very rarely found in Officer of the Watch style telescopes. With a stitched leather cladding on the main barrel, which apart from a few minor scuffs is in good condition, the undamaged lenses deliver a clear focused image and there is a swivel dust cover for the eyepiece end. The objective lens is protected by the integral leather end cap and the telescope is dent free, with a smooth draw action. John William Norie (1772-1843) began his career working as a chart maker with William Heather at the Naval Warehouse in Leadenhall Street in 1795. He was also a publisher of nautical books and is most famous for his Epitome of Practical Navigation in 1805. Norie took over the Naval Warehouse after Heather's retirement and founded the company J.W. Norie and Company in 1813, after Norie's death in 1843 the company became Norie and Wilson. This two draw mahogany barreled marine telescope is signed 'J W Norie & Co, London' with the signature running from the eyepiece toward the objective end, indicating this is likely to be is one of his earliest instruments made soon after 1813. A compact telescope weighing just over 370 grams, it measures 17.75" (450mm) fully extended, 8.25" (210mm) closed, and the 30mm objective lens is fitted in to the removable shuttered end cap. The brass draw tubes are in good dent free condition and the mahogany barrel is free of any splits or cracks. A near 200 year old telescope in good condition all round, the optics are also in good order giving a well focused image, albeit with the distinctive green tint intended to reduce reflected glare from the sea. This is a military style 3 draw tapered barrel field telescope, similar in many respects to those used by signalling regiments during WW1. Signed 'H. & G. 50X ' on the first draw, which I understand refers to a trading company known as Headquarters & General which was set up after WW2 to sell on ex military items to the general public. Apparently the company was run by ex soldiers, mostly officers and traded up to the 1960's. An impressive telescope, it measures 34” fully drawn with rayshade extended, and closes down to just over 11”. The 50mm visible diameter objective lens delivers a sharp clear image of 50x magnification, with no damage to any of the internal lenses. Cosmetically it’s in very good condition, the brass draw tubes still retaining much of their non reflective finish, and its dent free with a firm draw action. The leather cladding on the main barrel is also very good, the stitched seam being unbroken, and the carry strap is a relatively modern replacement. Nevertheless, this is a substantial, well made telescope weighing just over 1.5 kgs. A rare baleen clad six draw mariners pocket telescope dating to the first half of the 19th century engraved 'CARPENTER & WESTLEY, 24 Regents St. LONDON' on the first draw tube. Carpenter & Westley worked at the Regents Street address from 1835, and were best known as manufacturers of Kaleidescopes & magic lanterns, with very few telescopes produced by them making this a relatively rare example. It's a quality piece which is relatively unique in having its original baleen cladding (baleen is a form of keratin obtained from the Baleen whale and was used by mariners to decorate their telescopes in the early 19th century). It measures just 3.5" (90mm) closed, and the six draws extend it to an impressive 15.25" (390mm). The cosmetic condition is very good, with the baleen covering still firmly attached and a firm draw action through the six brass tubes. All optics are in good undamaged condition, and the 25mm diameter objective lens gives a clear image which focuses easily to a magnification of approximately 15x. There is a parallel dust slide to the eyepiece, but is missing its little external pip. A compact yet powerful little telescope it weighs 185 grams and not only very practical to use, but a fine example of a type that really does not come along very often. Specially designed to give very high magnification, the instrument has 4 draw tubes with a pancratic tube which enables the power to be be increased at will from 30x to a very powerful 60x, hence its name, 'The Super 60x Telescope'. It's in full working order with a clear sharp image and also in mint cosmetic condition as can be seen from the photos retaining all its anti glare bronzing, with no dents, or broken stitching on the leather work, it's clear this telescope has had very little use. Make no mistake this is a serious telescope in exceptional condition, which if the specification was repeated today would cost many hundreds of pounds. All buyers please note: due to weight, delivery may be by courier and therefore it is very important that a contact telephone number be entered through the shopping cart at checkout stage! This is an impressive high quality 3 draw field telescope by Negretti & Zambra with a stitched black leather cladding on the tapered barrel, in very good cosmetic condition. Engraved on the first draw 'NEGRETTI & ZAMBRA, LONDON' along with the distinctive N&Z intertwined logo, it also has the letters C.R.M. which presumably are the intials of a previous owner. Optically sound with undamaged lenses throughout, the large 55mm visible diameter objective glass delivers a bright and sharp image of approximately 25x, focusing from around 10 metres to infinity. The telescope objective lens is further protected with a brass end cap fitted inside the lid of the leather outer case, and there is an integral dust slide in the eyepiece cup, all tubes and main barrel are dent free with a firm draw action. Measuring 32.5" (830mm) fully extended with rayshade, and 10.25" (260mm) closed, it comes in its separate hard leather case which also has the letters C.R.M. Weighing just over 1 kg, and 1.5 kgs with its case, this is a substantial telescope in great cosmetic condition, by one of the most prestigious instrument makers of the 19th & 20th centuries. 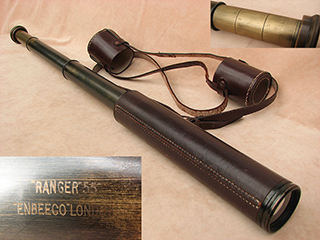 Manufactured by Newbold & Bulford under their brand name ENBEECO, this is a nice example of a powerful 2 draw field telescope, complete with its original leather cladding, engraved on the first draw 'RANGER (PAN), ENBEECO, LONDON'. It has a pancratic tube providing 4 levels of magnification from 30x, 37x, 46x to an impressive 55x power. The optics are all in good undamaged condition, and the 40mm objective glass delivers a bright sharp image. The image clarity is very good as is the overall cosmetic condition, and the leather cladding is free from any gouges or tears, with all the stitching intact. With a firm draw action, the draw tubes and main barrel are dent free, and still retain a large amount of their non reflective coating. Measuring 27" fully extended , 10.5" closed, and weighing just under 0.8kg, this is a substantial yet practical telescope for use on the move. This dimunitive Victorian mahogany and brass six draw telescope dates to the second half of the 19th century. It measures just 4.25" (110mm) closed, but the six draws extend it to an impressive 18" (460mm). The cosmetic condition is very good, with the main barrel clad in a dark mahogany veneer and the larger brass draw tubes have air escape holes, a sign of quality. All optics are in good undamaged condition, and the 30mm diameter objective lens gives a clear image which focuses easily to a magnification of approximately 15x. There is also an internal dust slide to the eyepiece to protect the eyepiece when not in use. Although unsigned, this compact telescope weighing just under 300 grams is not only practical to use, but a fine example of a smaller multi draw type that really does not come along too often. Comes in a modern drawstring pouch for protection. Dating to circa 1830, this large two draw mahogany barreled ships telescope is engraved 'Improved Day or Night' on the first draw and does have a makers name but is too rubbed to be legible, although the word London can just be made out under close magnification. The dark mahogany barrel is in very good condition with no splits or cracks, and the two brass tubes still have a nice draw action, albeit with the odd ding and some age tarnish, not uncommon in telescopes of this age. Protected by a removable brass end cap with external slide & a sliding rayshade, the 40mm visible diameter objective glass produces a good focused image of approximately 15 - 20x power and has a green tint for reduced glare at sea. A substantial telescope of impressive proportions, it measures 15" closed and 38" extended, and weighs just over 1.1 kgs. A classic antique telescope which is not only functional but is also a nice display piece. This is a mid 20th century 3 draw pocket telescope engraved "DENHILL Venus 18X" on the first draw. Denhill was the brand name of J A Davis & Son and derived from the DENmark HILL address from where they retailed many binoculars & telescopes which were outsourced from other manufacturers. Measuring 440mm extended and 160mm closed, the 25mm diameter objective lens delivers a well focused image of 18x magnification. In very good condition with neatly stitched leather cladding and dent free brass draw tubes, a compact telescope weighing just under 350 grams it's still practical for todays use. This fine Victorian leather clad brass six draw telescope dates to the second half of the 19th century. It measures just 5" (125mm) closed, but the six draws extend it to an impressive 18.5" (467mm). The cosmetic condition is very good, with all brass draw tubes free of dents and the main barrel has its original stitched leather covering. In good optical condition, the 30mm diameter objective lens, gives a clear image which focuses easily to a magnification of approximately 15x. There is an internal dust slide to the eyepiece to protect the eyepiece when not in use and still has its original brass end cap to protect the objective lens. Although unsigned, this is a well made compact telescope weighing just over 300 grams and not only practical to use, but a fine example of a multi draw type that really does not come along very often. A classic antique telescope, it comes with a modern velvet drawstring pouch for added protection. This vintage 2 draw field telescope is in fine condition, and comes complete with its original leather covering and end caps that have all their stitching intact. The optics are in very good order, and the 35mm objective glass delivers a bright sharp image of 20x magnification. The general condition is very good throughout, the two draw tubes are dent free with a firm draw action and still retain much of their original gunmetal finish for avoiding reflective glare when used in field pursuits. Measuring 10" closed, 24" fully drawn with rayshade extended, this is a quality telescope by a renowned maker, and weighing just over 950 grams is still very functional with a draw action that is smooth but firm. The 40mm objective lens delivers a sharp, clear image of approx 15x, and is free from any damage. Ottway were renowned for the quality of their telescopes and along with the war department crowsfoot symbol it also has the National Physical Laboratory testing logo for the year 1943. These telescopes were specially constructed for Naval use and are very robust, the cosmetic condition being good all round, with clean undamaged lenses. The leather cladding and protective leather end cap are also in very good condition, with all the stitching intact & the brass draw tube is free of any dents. This particular model has a diopter ring for pre focusing, and measures, 13.5" closed, 23" fully extended with sliding hood. A great telescope for display or every day use, it weighs just under 1.2kg. An antique 3 draw field telescope, complete with its original stitched leather covering and linked end caps with a later leather strap. Embossed 'W. APPEL.' between the cleats, I believe that this telescope belonged to one Quartermaster Sergeant W. Appel, member of the South African Colonial Corp National (Waldon's) Scouts and Orange River Colony Volunteers. Dating to the Boer war period at the end of the 19th Century, it measures 30.5" fully extended with sunshade, and 10" closed. In very good condition all round including the leather cladding & end caps, the draw tubes are dent free, with a tight but smooth draw action & retain virtually all their non reflective finish. The 40mm objective lens delivers a clear well focused image, and all internal lenses are also in good condition. A quality telescope with historical provenance, it weighs in at just over 800 grams and is still practical for todays field pursuits. A 3 draw leather clad field telescope with a fourth pancratic tube giving variable magnification of 25x-30x-35x & 40x. Optically sound, and free from any dents, the 40mm visible diameter objective lens delivers a clear focused image from 10mtrs to infinity. The leather covered main barrel is in excellent condition, with all stitching intact and comes with a later leather wrap case. Although it's unsigned, the maker is almost certainly Broadhurst Clarkson who probably made it on a wholesale basis for the retailer to rebrand. Measuring 10.5" closed, 32.5" fully drawn, this is a quality telescope weighing just over 900grams, and is still very functional with a draw action that is smooth but firm. This is a late 19th century single draw Royal Navy Officer of the Watch telescope engraved 'ROSS LONDON' and personalised with the inscription'A.W. Fawkes' on the collar. My research shows this to be Archibald Walter Fawkes, who was the younger brother of Admiral Sir Wilmot Hawksworth Fawkes, commander in chief of Australia Station in 1905, and later Commander-in-Chief Plymouth from 1908 until his retiremant 1911. Archibald Fawkes was appointed by Queen Victoria as Attorney-General of Gibraltar, a post he held from 1892 to 1902 and later became Puisne Judge of Orange River Colony in South Africa until 1910. The telescope does not have a serial number, suggesting it was probably a gift to Archibald Fawkes possibly from his brother Admiral Fawkes. The leather cladding is generally in good order and although the stitching is a little stretched is still firmly in place. The optics are generally in good condition with some minor edge chipping on one of the internal lenses (see inset photo), but this has no effect on the viewed image which is sharp and clear, giving a magnification of approximately 15x. Measuring 15.25" closed and 24.75" fully extended, this is a classic naval style telescope in good working order, and with some interesting provenance. This fine Victorian mahogany and brass six draw telescope dates to the second half of the 19th century. It measures just 7" (180mm) closed, but the six draws extend it to an impressive 30.5" (775mm). The cosmetic condition is excellent, with all brass draw tubes free of dents and the main barrel is clad in a dark mahogany veneer. All optics are in good undamaged condition, and the 40mm diameter objective lens gives a clear image which focuses easily to a magnification of approximately 20x. There is an internal dust slide to the eyepiece to protect the eyepiece when not in use and still has its original brass end cap to protect the objective lens. Although unsigned, this is a substantial yet compact telescope weighing just under 800 grams and not only practical to use, but a fine example of a multi draw type that really does not come along very often. A classic antique telescope of some quality which is not only functional but also a nice display piece. Made by H C Ryland, this WW2 Scout regiment 3 draw telescope is engraved 'TELE. SCT. REGTS. MK. 2, H C R & Son Ltd, No 20725, O.S. 126. GA.' on the first draw, it also has the military arrow showing it to have been issued into service. It was probably made towards the end of the war, as the tapered main barrel is covered in the vulcanised rubber finish, instead of leather which by that time had become quite scarce. The clean undamaged optics with a 50mm objective lens, deliver the clear sharp image one would expect from a telescope with such pedigree. All brass draw tubes are dent free with a smooth draw action, & the eyepiece cup is protected by an integral swivel dust cover which incorporates the coloured sun filter. The accompanying separate hard leather case is also in very good condition with a sturdy leather shoulder strap. Measuring 10.5" closed and 31.5" fully extended including sunshade, it weighs 1.2kgs and just over 1.6kgs with its case, making it an ideal field telescope for spotting. My research shows this to have belonged to Lieutenant Lauriston Lee Grey, an Officer aboard HMS Eskimo, a tribal class destroyer that supported the Allied landings in North Africa in 1942 and was involved in the sinking of the German submarine U-971 in June 1944. Lieutenant Grey would later be decorated with the The Distinguished Service Cross. This telescope is not only visually impressive with its nickel silver draw tube & fittings, but also delivers a sharp, clear image through the 32mm objective lens. The condition is very good, with superb optics giving approximately 18x magnification, and completely dent free as is the leather cladding. A classic naval telescope at nearly 80 years old, it measures 18" closed (460mm) and 24.25"(620mm) fully extended with sliding sun shade. A classic single draw Royal Navy WW2 Officer of the Watch telescope engraved 'CKC PATTERN 373C, no 2875’ on the first draw. Made by the Canadian Kodak Company for the military it also has the war department arrow inside the letter C and is based on the British specification made by Ottway & Ross. These telescopes were specially constructed for Naval use and are very robust, with a nickel plated draw tube and fittings, and the main barrel having the black rubberoid covering which is in good sound condition. All lenses are in good condition with the 40mm diameter objective lens producing a sharp, clear image of approx 15x. This particular model also has a diopter ring for pre focusing, and the cosmetic condition is excellent with no loss of the nickel plating on the draw tube which is also free of any dents. Weighing just over 900 grams and measuring 13" (335mm) closed, 23.5" (600mm) fully extended with sliding ray shade, this is a fine telescope for display or every day use. This is a nice example of a Victorian 3 draw mahogany marine telescope dating to the second half of the 19th century. All lenses are in good order, with a protective brass end cap for the main lens, an integral swivel dust cover that protects the eyepiece and a 40mm diameter objective lens which produces a well focused image of approximately 15-20x magnification. In very good cosmetic condition all round, the mahogany barrel in particular has a deep rich patination with no splits or cracks and has a smooth draw action with the brass tubes free of any dings or dents. Although unsigned, this is a quality piece over 130 years old, measuring 9.75" (245mm) closed and 29.25" (742mm) extended, weighing in at 700 grams it is still practical for todays use. WW2 Scout Regiment telescopes are becoming increasingly difficult to find in acceptable condition, but this leather clad example is in very good order. Made by Broadhurst Clarkson, it's a 3 draw scope with a 22x magnification, engraved 'TEL. SCT. REGT. MK. II s, B.C Ltd & CO, 8618, O.S. 126. GA.' on the first draw, it also has the military crowfoot. It has clean, undamaged optics with a 50mm objective lens, giving a very clear & well focused image of approximately 22x. The brass draw tubes have a firm draw action, and the main barrel leather cladding is in very good condition with all stitching intact. The eyepiece is protected by an integral swivel dust cover which incorporates the coloured sun filter, and the accompanying separate hard leather case is also in very good condition with all stitching and straps still sound. Measuring 10.5" closed and 31.5" fully extended including sunshade, it weighs just under 1.1kgs and 1.6kgs with its case, making it an ideal field telescope for spotting. A fine example of a 3 draw Signalling telescope made by Dollond and engraved on first draw tube, "SIGNALLING" DOLLOND LONDON, No 11280, it comes with its original two interchangeable lenses marked HIGH & LOW, which equate to approx 30x & 15x respectively. It dates to the inter war period, probably around the 1920's, and is an impressive telescope, measuring 32" fully extended with sunshade, and 10" closed. The 50mm visible diameter objective lens produces an image which is very sharp & clear, and all lenses are free of any damage. In good condition all round including the leather cladding & end caps, the draw tubes are dent free with a firm draw action, retaining most of the original anti glare finish. This is a quality telescope by a renowned maker, complete with its accessories and shoulder strap which although a little worn is still sturdy. Weighing in at just over 1.3 kgs it's still practical for todays field pursuits. This fine Victorian mahogany and brass six draw Victorian pocket telescope is signed 'Edw'd Davis - Leeds' and date to the second half of the 19th century. It measures just 3.5" (90mm) closed, and the six draws extend it to an impressive 14.75" (375mm). The cosmetic condition is excellent, with all brass draw tubes free of dents and the main barrel is clad in a dark mahogany veneer. All optics are in good undamaged condition, and the 25mm diameter objective lens gives a clear image which focuses easily to a magnification of approximately 15x. There is a parallel dust slide to the eyepiece to protect the eyepiece when not in use and it comes in modern velvet pouch for protection. A compact yet powerful little telescope it weighs 175 grams and not only practical to use, but a fine example of a type that really does not come along very often. This is quite a rare example of a 19th century German three draw mahogany barrelled Marine telescope engraved 'Merz Utzschneider und Fraunhofer in München' in flowing script on the first draw. Dating to the first half of the 19th century the partnership of Georg Merz, Joseph von Utzschneider and Joseph Fraunhofer operated as as Munichs leading authority in the manufacture of glass and optical instruments before the deaths of Fraunhofer in 1826 and Utzschneider in 1839. It has an objective lens with a diameter of 30mm, giving a sharp, clear image of around 20x magnification with a slight green tint to reduce reflected glare from the sea. All lenses are free from damage and it comes with its original protective end cap and swivel dust cover inside the eyepiece cup. In excellent cosmetic condition all round, the mahogany barrel is free of any splits or cracks, and the draw action is smooth but firm with the brass tubes free of any dings or dents. Measuring 21" (540mm) fully extended and 7.5" (190mm) closed, and weighing just under 400 grams without its leather case, this is a high quality antique telescope well over 150 years old yet still practical for use today. This is a mid 19th century 3 draw mahogany banded marine telescope which measures 10" closed and 35" extended including sun/dew hood. It has an objective lens with a visible diameter of 40mm, giving a sharp clear image of around 20x magnification, and all lenses are free from damage. In good condition all round, the mahogany veneered barrel is free of any splits or cracks, and the draw action is smooth but firm. Although no longer having the internal dust cover in the eyepiece cup, it does still have its original brass cap for the objective glass. A 150 year old antique telescope which is not only stylish but still very functional. 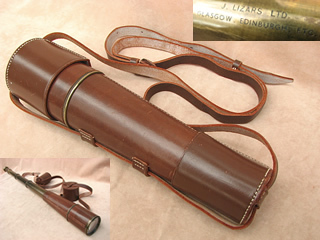 A vintage 2 draw field telescope, complete with its original stitched leather covering and linked end caps, it's engraved on the first draw 'QUICK FOCUS RIFLEMAN J H STEWARD Ltd LONDON'. Although this is a relatively slim field telescope with a 30mm objective glass, it delivers a sharp image of around 20x magnification, and incorporates a quick focus tube. J H Steward still have a strong association with rifle clubs in the UK, and this model was probably designed for use as a target spotting scope. All lenses are in undamaged condition, and it's in very good condition throughout with only minor scuffing on the leatherwork. The draw tubes still retain all of their original anti glare coating, and the draw action is firm but smooth. Measuring 24" fully extended with screw on ray shade, 12" closed, and weighing just over 0.7 kg makes this a practical telescope for regular use, particularly on the move. Its not often one comes across commemorative telescopes of such quality, this particular one is engraved 'HILLARY - EVEREST, x25 - x40, Made in England'. Newbold & Bulford produced a number of themed telescopes during the 1950's, the best known of which was the Hillary -Everest model to celebrate the conquest of Mount Everest by Edmund Hillary on the 29th May 1953, but not many survive in such fine condition. It has 2 draw tubes with an additional pancratic tube giving four levels of magnification, 25x-30x-35x-40x, and the 40mm objective lens delivers a very crisp, clear image. Covered in a medium tan colored leather with all stitching intact, the lenses are protected by matching leather end caps with a shoulder strap. The draw tubes have a firm but smooth draw action, are free of any dents, and retain all their anti glare coating, indicating that the scope has probably not had a great deal of use. This is a powerful, high quality field telescope in exceptional condition, with a special association to one of the most historic events of the 20th century. In full working order, it measures 10.75" closed, 28.75" fully extended, and the weight is a very manageable 1.2kgs. This is quite a rare example of a WW2 Scout Regiment telescope, engraved ‘TEL. SCT. REGT. MK. 2. S, K.E.C. O.S. 126 G.A. 22208 ’ on the first draw, indicating it was made by the Kodak Eastman Company at their factory in North London, and this example also has the Military arrow impressed on it. It has clean undamaged optics which produce the clear image one would expect from a telescope with such a pedigree. The brass draw tubes are generally dent free with the exception of a couple of very small dings on the first draw tube but do not affect the draw action which is still firm, and the eyepiece cup has a swivel dust cover which incorporates a light filter. The cosmetic condition is good although the the telescope has been well used and there is some staining on the leather cladding but all stitching is intact. It also comes with its original separate hard leather case which is in good sound condition and a later shoulder strap. It has a 50mm main objective lens, measures 10.5" closed and 31.5" fully extended including sunshade. The weight is 1.2kgs and 1.6kgs with its case, making it an ideal field telescope. This is a fine condition 3 draw leather clad field telescope by Broadhurst Clarkson, which appears not to have had a great deal of use, retaining virtually all of its non reflective coating on the 3 draw tubes. This particular model is called the 'Tourist', and is ideal for spotting, being optically sound with a 40mm visible diameter objective lens producing a sharp clear image to a magnification of 25x. 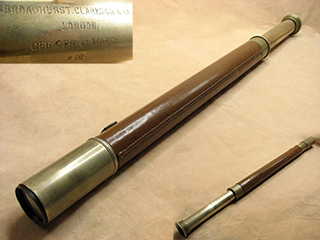 Engraved 'Broadhurst Clarkson & Co Ltd, 63 Farringdon Road, London E.C' on the first draw, it measures 10" closed 31" open with sunshade extended, a quality telescope weighing just under 1kg, and perfect for use on the move. This powerful 3 draw leather clad field telescope was made by Broadhurst Clarkson & retailed by H Salanson & Co in Bristol, probably during the inter war period of the 20th century. Not only in very good cosmetic condition, it's also free from any dents and the brass draw tubes have a smooth but firm action. With a large objective lens of 55mm visible diameter giving a magnification of approximately 30x, it's ideal for spotting and produces a clear well focused image. All lenses are in good undamaged condition, and the telescope also disassembles easily for access to the internal lenses, enabling them to be cleaned in the field. The leather covered tapered main barrel is also in very good condition with all stitching and seams intact, including the protective end caps, which are attached to the shoulder carry strap. 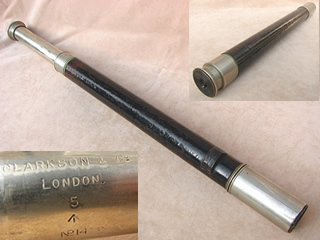 Engraved 'BROADHURST CLARKSON & CO. LTD, 63 FARRINGDON ROAD, LONDON E.C' on the first draw, it measures 10.25" closed, 31" open with sunshade extended, a quality telescope weighing just under 1.2kg, and a pleasure to use. A fine example of a WW2 naval Officer of the Watch telescope by W Ottway & Co Ltd, Ealing, London, serial no 5432. Manufactured during the 1930's, this telescope is not only visually impressive with its German nickel silver draw tube & fittings, but also delivers a sharp, clear image through the 35mm objective lens. Ottway telescopes were made to the highest standards with all components stamped with the same serial number, and this particular one also carries the National Physical Laboratory testing logo for 1944, along with the war department arrow. The condition is very good, with superb optics giving approximately 18x magnification, and completely dent free. The leather cladding is in very good condition and there is a leather end cap but without the retaining strap. A classic naval telescope, it measures 18" closed and 25" fully extended with sliding sun shade, there is also an integral sliding dust cover in the eyepiece cup. Although unsigned this early 20th century single draw Officer of the Watch Naval telescope is a quality piece which is likely to have been made by one of the major makers of the day on a wholesale basis for rebranding by a naval outfitters. Of nickel plated brass construction with a stitched leather cladding on the main barrel, it's in very good condition throughout with dent free tubes, & all stitching is intact including the original leather endcap. The clean undamaged lenses deliver a powerful clear image of approximately 18x magnification, through the 32mm diameter objective lens, and there is a protective swivel dust cover in the eyepiece cup. Measuring 26" fully extended including sunshade and 18" closed, it weighs just under 800 grams. A classic style of Naval telescope in good working order, and still practical for regular use. A fine example of a large 3 draw mahogany clad marine telescope dating to circa 1830. The mahogany barrel is in very good condition with no splits or cracks and the brass draw tubes still have a firm draw action with no dents. Protected by a removable brass end cap with external slide, the 40mm objective glass produces a very clear, focused image of approximately 15 - 20x power, and the eyepiece is also protected by an external slide built into the cup. Measuring 12" closed and 35" extended it has an unpacked weight of just over 1.1 kgs. Although unsigned this is a classic antique telescope of over 180 years old which is in full working order with undamaged clear optics. A 19th century 3 draw mahogany veneered barreled telescope, engraved ' SALOM & CO, RECCNNOIT'RER, EDINBURGH ' on the push fit brass end cap. Benjamin Salom established his business in the early Victorian period and I would date this telescope to around 1870. A pocket size telescope, measuring 6" closed and 16" extended , with a visible objective lens diameter of 23mm, it produces an image of around 15x magnification. All lenses are free of any chips or cracks, and the telescope fully disassembles for easy access to clean. Generally in very good condition, the mahogany barrel has a rich patination, and although the larger third draw tube does have a very minor crease it doesn't affect the draw action which is firm with no wobble. A compact yet practical antique telescope, the eyepiece cup also incorporates a swivel dust cover for protecting the eyepiece lens. This is a 3 draw mahogany & brass telescope engraved 'G Christian, Liverpool' in a flowing script on the first draw, made by George Christian who was an instrument maker working in Liverpool during the mid 19th century. Intended for marine use, the mahogany barrel does have some light surface scuffing but is free of any splits or cracks, and the brass fittings are firmly fixed despite missing the odd screw. The three brass draw tubes are also in very good condition with a smooth draw action. All lenses are free from any damage, with the 38mm visible diameter objective producing a clear & sharp image of approximately 15-20x. A well made telescope weighing just over 500 grams, it measures 10" (255mm) closed and 30.5"(775mm) extended, and although it doesn't have a brass end cap it still has the integral dust cover inside the eyepiece cup. Intended for marine use, the mahogany barrel is free of any splits and cracks and the four brass draw tubes are also in very good condition with no dents. All lenses are free from any damage, producing a well focused image from the 48mm visible diameter objective lens, giving a magnification of approximately 25x, albeit with the distinctive green tint which was intended to reduce reflected glare from the sea. A large well made telescope, measuring 11.5 inches (950mm) closed and 43.5" (1105mm) extended, it weighs just under 1.1 kgs. The design of this 3 draw leather clad field telescope by Dollond London is based on the signalling series used by scouting regiments in WW1 and is engraved on first draw tube, 'DOLLOND LONDON'. It comes with its original two interchangeable eyepiece lenses marked 15x & 30x respectively, and all lenses are in good undamaged condition, giving a very clear & sharp image through the 50mm objective lens. Dating to the inter war period probably around the 1920's, it's an impressive telescope measuring 36.5" fully extended with sunshade, and 12" closed. In great condition all round including the leather cladding & end caps, the draw tubes are dent free, with a tight but smooth draw action & retain the majority of their non reflective finish. A quality telescope by a respected maker, complete with its accessories and shoulder strap, it weighs in at just under 1.5kgs & is still very practical for todays field pursuits. A rare baleen clad six draw mariners pocket telescope dating to the first half of the 19th century signed 'THOMPSON YARMOUTH' produced by the maker Simon Thompson who operated in Great Yarmouth between 1804-1844. It measures just 3.5" (90mm) closed, and the six draws extend it to an impressive 15.5" (392mm). The cosmetic condition is very good, with all brass draw tubes free of dents and the baleen covering still firmly attached. All optics are in good undamaged condition, and the 25mm diameter objective lens gives a clear image which focuses easily to a magnification of approximately 15x. There is a parallel dust slide to the eyepiece, and a separate end cap for the objective. A compact yet powerful little telescope it weighs 150 grams and not only very practical to use, but a fine example of a type that really does not come along very often. A rare example of a 2 draw leather clad field telescope almost certainly made by Broadhurst Clarkson for the London retailer J A Davis & Son in the 1950's. Engraved "DENHILL JUPITER X25" it carries the Denhill name which was the brand name of J A Davis & Son and derived from the DENmark HILL address from where they retailed mainly binoculars & some telescopes, all outsourced from other manufacturers. Optically sound with all draw tubes free from any dents, the 32mm visible diameter objective lens delivers a clear focused image of 25x power. The leather covered main barrel is in excellent condition with all stitching intact, and comes with its protective leather end caps & shoulder strap. Measuring 10" closed, 25" open, this is a fully functional telescope weighing just under 1 kg, making it very practical for regular use. This is an excellent condition 3 draw leather clad field telescope by Dollond London, which appears to have had relatively little use, retaining much of its non reflective coating on the 3 draw tubes. This particular model has a magnification of 25x, which is is ideal for spotting, being optically sound with a 40mm visible diameter objective lens producing a clear & sharp image. The leather covered main barrel is in very good condition with all its stitching intact including the protective end caps, one of which has a previous owners initials R.J.W. and the dent free draw tubes have a smooth, yet firm draw action. Engraved 'Dollond London, x25' on the first draw, it measures 10 1/4" closed, 31" open with sunshade extended, a quality telescope weighing just over 1kg, and great to use. This 20th century single draw Officer of the Watch Naval telescope is signed 'NEGRETTI & ZAMBRA LONDON'. Dating to the post WW2 period, it's constructed in nickel plated brass with a stitched leather cladding on the main barrel which is personalised with a former owners initials (J.T) in gold gothic style lettering. It's in very good cosmetic throughout and although it does have the original leather end cap, the retaining strap to the main barrel is no longer present. The clean undamaged lenses deliver a powerful clear image of approximately 18x magnification, and there is a protective swivel dust cover in the eyepiece cup. It measures 25.25" fully extended including sunshade, 18" closed, with an objective lens of 30mm visible diameter, and weighs just over 850 grams. A classic style of Naval telescope in good working order by one of the most prestigious scientific instrument makers of the 19th & 20th century. This is a powerful but compact 2 draw field telescope made by Newbold & Bulford, and engraved on the first draw ' RANGER 55 ENBEECO, LONDON, Made in England'. In very good condition all round with dent free tubes, it has its original leather cladding which is firmly in place with unbroken stitching, and only some minor scuffing. The pancratic tube provides 4 levels of magnification from 30x, 37x, 46x to an impressive 55x power with good undamaged optics and a 40mm objective glass that delivers a bright sharp image. It has two leather end caps for protecting both the objective glass & eyepiece, and there is a shoulder strap which although well worn is still in one piece. Measuring 27" fully extended , 10.5" closed, and weighing just under 1kg, this is a substantial yet practical telescope for use on the move. Dating to the first half of the 19th century this is a fine example of a particularly large 5 draw mahogany barreled telescope, engraved 'Crichton, 112 Leadenhall St, LONDON' in flowing script on the first draw. This refers to John Crichton who worked at this address from 1830 until 1865, and who also exhibited at the Great Exhibition of 1851. Intended for marine use, it has a mahogany barrel with five brass draw tubes, and still has its original green tint objective lens which has a visible diameter of 50mm. All lenses are in good condition, and the image (approximately 15x magnification) is well focused, but is dimmed by the distinctive green tint in the objective lens which was intended to reduce reflected glare from the sea. Although a large telescope measuring 41.5" (1050mm) when fully extended, 9.5" (245mm) closed, it is very manageable weighing just over 1kg. Housed in its original fibre case, it's in very good cosmetic condition all round, no splits or cracks in the mahogany barrel, the only blemishes being some very minor dings to the brass draw tubes, but these don't affect the performance of the telescope, which is fully functional. Alexander Thomas Clarkson is perhaps better known as one half of the Broadhurst Clarkson name, which Robert Henry Broadhurst continued using long after the 1892 partnership was dissolved in 1909. Telescopes made by Clarkson on his own after this time are really quite rare and this WW1 naval Officer of the Watch example is of particular interest as it also has the very low serial number 5, which suggests not very many were produced. Engraved 'CLARKSON & Co, LONDON, 5, ↑, NPL14' on the first draw demonstrated it was tested at the National Physical Laboratory in 1914. The telescope has clearly had some use, but the condition is generally good, with undamaged optics giving a nice clear image of approximately 18x magnification, and is completely dent free. The leather cladding appears to have been over painted at some point in the past, and still has the retaining loop attatched, although the leather end cap is no longer present. The stitched seam is also slightly stretched in places but is unbroken, see photos. It has a 35mm objective and measures 18" closed, 25" fully extended with sliding ray shade. A powerful 3 draw leather clad field telescope by Broadhurst Clarkson, which has the modified eyepiece cup that can accomodate either a low or high power lens cell, and this particular example is fitted with the high power lens giving a magnification of 30x. The tapered main barrel is covered in stitched brown leather in very good condition, with all stitching intact on the cladding & end caps. There are two protective leather end caps, plus a shoulder carry strap which although well worn is still serviceable, and the brass draw tubes have a firm action. Engraved 'Broadhurst Clarkson & Co, 63 Farringdon Road, London E.C', and measuring 10.25" closed, 30.75" fully drawn with sunshade extended, the objective glass has a diameter of 50mm giving a clear sharp image. It weighs just over 1.1kgs and is a practical telescope to use for spotting. Although unsigned this telescope has the same specifications as the ULTRA models made by Broadhurst Clarkson. Not many ULTRA models were made so they don't come along very often, being lighter than the Tourist models they were intended to appeal to hikers. This particular example was made by Broadhurst Clarkson on a wholesale basis for rebranding by another retailer, and is in good cosmetic condition. The brass tubes are dent free and retain virtually all of their non reflective coating with a draw action which is smooth but firm. 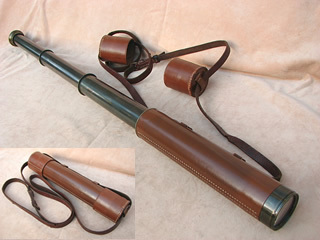 As can be seen in the photos, the leather covered main barrel is in very good condition with all stitching intact, and each end is protected by leather end caps with a carrying strap which is a little worn. Measuring 10.25" closed,29.5" open, this is a fully functional telescope weighing just under 0.9kg, making it very practical for use on the move. A nice example of a late Victorian 3 draw basket weave clad marine telescope with lacquered brass fittings. Measuring 8.5" (215mm) closed and 26" (660mm) extended, with an objective lens diameter of 35mm, it's in very good condition with no dents & optics are clear and undamaged, delivering a sharp image. Complete with a lacquered brass lens cover & sliding shutter at the eyepiece end, it still has one of the original loops for attaching a lanyard. Weighing just under 0.4kgs it's unsigned but a quality piece nevertheless. This 5 draw pocket telescope, was probably made in the main for nature watchers such as ornithologists for use in the field. Unsigned, it measures only 4.50" (115mm) closed, the five draws extend to an impressive 14.75" (375mm) making it the ideal accessory for spotting on the move. The optics are in good condition and the 26mm visible diameter objective lens, gives a clear image which focuses easily to a magnification of approximately 10x. A compact yet powerful little telescope, it comes with its original protective end cap. A powerful 3 draw leather clad field telescope signed J. Lizars, which is fitted with an additional pancratic draw tube, enabling the power to be increased at will from 25x to 40x in 4 stages of 5x. This is a great advantage as objects not clearly seen can be readily observed with the 40x setting. There are two protective leather end caps plus a shoulder carry strap, and the draw tubes are bronzed brass still retaining much all of their anti glare coating. Engraved 'J. LIZARS, GLASGOW, EDINBURGH, ETC', and measuring 10.5" closed, 34.5" fully drawn with sunshade extended, the object glass has a diameter of 55mm which delivers a clear well focused image. The cosmetic condition of this telescope is very good as can be seen from the photos, is fully functional with clean undamaged lenses, and dent free draw tubes which have a smooth but firm draw action. It weighs just over 1.3kgs and is a great telescope to use for spotting. Probably dating to the post WW1 period, this fine example of a Naval Officer of the Watch telescope is engraved 'T.COOKE & SONS Ltd, LONDON & YORK, No 2502' on the first draw. Not only visually impressive with its German nickel silver draw tube & fittings, it also delivers a sharp, clear image through the 35mm objective lens. The condition is very good, with undamaged optics giving approximately 18x magnification, and completely dent free. The leather cladding is in very good condition with all stitching intact and still has the retaining loop attatched although the leather end cap is no longer present. Dimensions, 18" closed, 25" fully extended with sliding sun shade, the eyepiece sliding dust cover is also missing, but doesn't affect its functionality. A nice example of a Victorian 3 draw pocket size mahogany veneered telescope dating to around 1880. All lenses are in good order, with a protective brass end cap for the main lens, a dust slide for the eyepiece, and the 28mm visible diameter objective lens produces a well focused image of approximately 15x magnification. In good condition all round, the mahogany veneer on the main barrel in particular has a rich patination, and the dent free brass tubes also have a smooth draw action. Although unsigned, this is a quality telescope, measuring 6.25" closed and 16.25" extended. The image clarity is very good as is the overall cosmetic condition, and the leather cladding is free from any gouges or tears, with all the stitching intact including the leather end caps & shoulder strap.. The draw tubes and main barrel are dent free, and still retain all of their non reflective coating. It has a 30mm objective glass which delivers a very clear, sharp image of 25x magnification, and there is a swivel dust slide inside the eyepiece cup which is missing its small pip, but this is only a minor point that I mention for accuracy. Measuring 24.5" fully extended, 10.25" closed, and weighing just over 0.9kg, this is a slim yet substantial telescope, ideal for field pursuits. The 40mm objective lens delivers a sharp, clear image of approx 15x, and is free from any damage. Ottway were renowned for the quality of their telescopes, with each component numbered to the serial number, and along with the war department crowsfoot symbol, it also has the National Physical Laboratory testing logo for the year 1945. These telescopes were specially constructed for Naval use and are very robust, the cosmetic condition being good all round, with clean undamaged lenses. The leather cladding and protective leather end cap are also in sound condition, with all the stitching intact & the brass draw tube is free of any dents. This particular model has a diopter ring for pre focusing, and measures, 13" closed, 23" fully extended with sliding hood. A great telescope for display or every day use, it weighs just over 1kg. Dating to the first quarter of the 19th century, (circa 1820) this is a rare example of a large 5 draw mahogany barreled telescope, engraved 'BANKS London'on the first draw. Made by Robert Bancks who was best known for his microscopes, his instruments were signed either Banks or Bancks, and later became Bancks & Son who made microscopes & telescopes for Charles Darwin. All lenses are free from any damage, and the image (approximately 15x magnification) is sharp, albeit with the distinctive green tint which was intended to reduce reflected glare from the sea. Although a large telescope measuring 44" (1120mm) when fully extended, 10" closed, it is very manageable weighing only 0.9kgs. Housed in a soft leather case, it's in very good cosmetic condition all round, no splits or cracks in the mahogany barrel. The only points to note are some minor dings to the second brass draw tube, and the objective lens holder has a small dent around its rim, as does the eyepiece cup which is also missing the small pip on the internal dust slide. These are very minor cosmetic blemishes which do not affect the performance of the scope, but I mention them for accuracy and most are visible in the larger images. Interestingly, it also carries the Broadhurst Clarkson name showing it was retailed by them at some point in the early part of the 20th century, and was probably considered an antique collectable even then! This is a military style 3 draw tapered barrel field telescope, similar in many respects to those used by signalling regiments during WW1. Signed 'H. & G. 30X ' on the first draw, who I have to confess is a maker I have yet to track down, although it may stand for Headquarters & General, a term often used for telescopes made for the general staff of the British army, but the absence of the military arrow makes this assumption questionable. An impressive telescope, it measures 34” fully drawn with rayshade extended, and closes down to just over 11”. The 50mm visible diameter objective lens delivers a sharp clear image of 30x magnification, with no damage to any of the internal lenses. Cosmetically it’s in very good condition, the brass draw tubes still retaining virtually all of their non reflective finish, and its dent free with a firm draw action. The leather cladding on the main barrel is also very good, the stitched seam being unbroken, the only points to note are that the end caps have a glued seam, and the carry strap is a relatively modern replacement. Nevertheless, this is a substantial, well made telescope weighing just over 1.5 kgs. A classic 3 draw Naval telescope from one of the exceptional makers of the 19th century, Spencer Browning & Co, who succeeded Spencer Browning & Rust in 1840. They specialised in instruments for navigational use, and there are now relatively few telescopes to be found by Spencer Browning. This particular example is engraved 'Spencer Browning & Co, London, Day or Night' on the first draw, & dates to circa 1850. 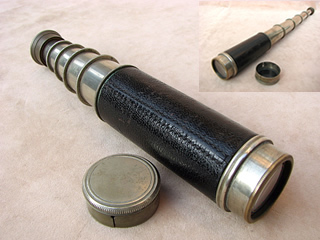 A genuine antique telescope of substantial proportions, the main barrel has been neatly recovered in a modern leatherette material with a very neat stitched seam, yet is still a visually impressive piece with an excellent image clarity which far exceeds what one would expect from a 160 year old instrument. The segmented single draw tube still has a firm draw action, and all lenses are in good order giving a magnification of approximately 15x through the 50mm green tint objective lens. It measures 20.25" (515mm) closed, 38" (965mm) fully extended with sliding ray shade, there is also an internal swivel dust cover on the eyepiece. A single draw telescope it would have been used for general observations or reading signals between ships, and weighs just under 1.6kg. This 3 draw marine pocket telescope dates to the latter part of the 18th century, and is signed ‘Dollond, London’ in flowing script along the first draw tube. A compact telescope it measure 13.75” (350mm) extended, & 5.25” (135mm) closed, having a mahogany barrel in very good order, with no splits or cracks. The 3 part segmented first draw tube unscrews to reveal three lens cells with a total of four lenses, which was a typical late 18th century layout. The main objective lens is the original green tinted glass, has a diameter of 30mm and is free from any chips, producing a clear well focused image of around 15x magnification, albeit with the green tint which was intended to reduce reflected glare from the sea. All lenses are in good undamaged condition, and the telescope disassembles for access to the internal lenses. The draw tubes are also in good condition with no dents and, and still have a firm draw action, and the eyepiece cup does have its swivel dust cover. It comes with what appears to be its original tube case, which is in sound condition despite missing a piece of the inner sleeve as shown in the photos. A 200 year old working telescope in very good uncleaned condition, by a much sought after maker. Made by Joseph Smith, who is recorded as working between 1817 to 1846, this 3 draw telescope is engraved 'J. Smith, Royal Exchange, London' in an ornate script, on the first draw. Intended for marine use, it has a mahogany barrel with three brass draw tubes, and still has its original green tint objective lens with a visible diameter of 40mm. All lenses are free from any damage, and the image (approximately 15x magnification) is clear & sharp, albeit with the light green tint which was intended to reduce reflected glare from the sea. A comfortable size telescope, measuring 9.75" closed and 30.5" extended, it's in very good cosmetic condition with no cracks or splits in the mahogany, and dent free draw tubes. A fine 3 draw leather clad tapered barrel field telescope made to the same spec as the signalling telescopes of WW1. At the end of WW1 ex military instruments entered the army surplus market and many telescopes were reconditioned by Broadhurst Clarkson for resale to civilians, which involved replacing the first draw tube carrying the military markings & serial numbers with either plain tubes, or rebranded ones according to where it would be retailed. This is an unsigned example which comes with interchangeable eyepiece lenses one marked HIGH and the other LOW, the lens not in use is attached to the carrying strap in its own leather case, ready to be changed when out in the field. Measuring 33" (840mm)extended, 11.25" (285mm) closed, the 50mm visible diameter objective glass delivers a crystal clear image of 15x on low, 30x on high, and all lenses are free of any damage. This telescope is in very good condition with dent free draw tubes and the leather cladding is also sound with all stitching intact although two of the strap cleats have been strengthened with leather glue. This is a substantial telescope weighing 1.8kgs including the spare lens, and has all the attributes of a good spotting telescope. This 3 draw telescope dates to the latter part of the 18th century, and is signed ‘Dollond, London’ in flowing script along the first draw tube. The main objective lens has a diameter of 40mm and all lenses are free from any damage, producing a well focused image of around 20x magnification. The brass draw tubes are also in good condition with no dents and, and still have a firm draw action, although the eyepiece cup is missing its internal swivel dust cover. An antique working telescope over 200 years old, in very good condition by a much sought after maker, it comes with a leather case which is a later 19th century addition but a good fit nevertheless. A nice example of a WW1 period, single draw Officer of the Watch Naval telescope signed, ROSS, LONDON, No 56603. Nickel plated brass construction with a leather cladding on the main barrel, it's in very good condition throughout, with only minor wear. All lenses are chip & scratch free and although there is some very light spotting on the 32mm main objective, the 18x image is clear & sharp. All the stitching is intact on the leather cladding, and it measures 24.5" fully extended including sunshade, 17" closed. The eyepiece cup has an integral swivel dust cover, whilst the main lens is protected by a separate brass end cap. A genuine Ross classic telescope in full working order, ideal for all naval and marine collectors. It dates to around 1900, is of blackened brass construction and the main barrel has been re-covered at some point in the distant past with a black leather type material, but still in keeping with the telescope's overall appearance. The telescope is in very good condition all round, with no dents and the lenses produce a bright clear image, although there is a very small edge chip on the main objective which is only noticeable on close inspection and doesn’t affect the image in any way, but I mention it for accuracy. Measuring 29.5" (745mm) fully extended including sunshade, and 8.5" (215mm) closed, it weighs just under 0.7kg. This is a well made quality telescope in full working order, with a swivel shutter on the eyepiece and a separate protective brass end cap for the main lens which has a visible diameter of 40mm. Better known as a prolific maker of field telescopes for the British Army during both WW1 & WW2, Broadhurst Clarkson were not known for producing naval telescopes, so this is a particularly rare example of an early 20th century single draw Officer of the Watch telescope. Engraved 'BROADHURST CLARKSON & CO, LONDON, CADET, x 18' on the first draw, it was likely made as a presentation piece for prize awards to Naval cadets. The main barrel is covered in its original dark brown leather stitched cladding, which is also in very good condition with no scuffing, although there is some very light colour shading at each end. All lenses are clean & free of any damage, producing a very clear and sharp image of 18x magnification through the 35mm diameter objective lens, which is protected by a separate end cap, whilst the eyepiece has an integral swivel dust cover. A classic style of Naval telescope, it measures 18" closed, 26" fully extended with sliding sun shade, and weighs just under 0.8kg. Its quite unusual to find a typical Officer of the Watch style telescope being made for anything other than for use in a marine environment, but this particular example is engraved 'S.M.R.C. "SPECIAL" on the first draw, which indicates it was made for the Society of Miniature Rifle Clubs probably in the first quarter of the of the 20th century. The word "Special" is also of interest and I believe suggests the telescope may be linked to the conversions of .303 Martini-Enfield rifles which were rebarreled to .22 rimfire and also carried the words S.M.R.C. Special. These conversions were carried out by C.G. Bonehill who were the main suppliers of rifles to the SMRC from 1900. The main barrel is covered in its original dark brown leather stitched cladding, and the draw tube and fittings are nickel plated brass, all of which are in very good condition. All lenses are clean & free of any damage, with a clear image through the 35mm diameter objective lens, this is protected by a leather end cap whilst the eyepiece has an integral swivel dust cover. It measures just over 18" closed, 25.5" fully extended with sliding sun shade and weighs just under 0.7 kg. This 3 draw leather clad field telescope by Dollond London has a magnification of 25x, which is is ideal for spotting. It's optically sound with a 42mm visible diameter objective lens producing a clear & sharp image. The telescope is completely dent free and the brass draw tubes have a smooth yet firm draw action. The leather covered main barrel is in particularly good condition with all its stitching intact, including the protective end caps and leather shoulder strap. Engraved 'Dollond London, x25' on the first draw, it measures 10 1/4" (260mm)closed, 31.35" (795mm) open with sunshade extended, a quality telescope weighing just under 1.1 kg, and great to use on the move. A rare seven draw leather clad brass pocket telescope dating to the first quarter of the 19th century, engraved "Tagliabue London" in a flowing script on the eyepiece cup. Originally the company was established in 1799 by Caesar Tagliabue, an instrument maker, in the Holborn area of London . Before the end of 1820 Tagliabue had moved to 23 Hatton Gardens, and in 1838 invited his son in law Louis Pascal Casella to join the business, after which the instruments were signed Tagliabue & Casella. Measuring only 5" (125mm) closed, with the seven draws extending to an impressive 21.25" (540mm) the cosmetic condition is very good, with all tubes free of dents and a smooth yet firm draw action, and weighs just over 400 grams. The 30mm visible diameter objective lens is made up of a triplet, two of which have a strong green tint which suggests this was probably made for use at sea & gives a tinted image of approximately 15x magnification. However whilst all lenses are chip free, there is a small scratch on one of the internal lenses (see photos) which does show as a small faint smudge in the viewed image but happily doesn't detract too much from the image which is well focused. The eyepiece cup has a slight distortion around the rim, with a parallel dust slide to protect the lens, whilst the objective lens is protected by a separate end cap. The above blemishes are minor for a near 200 year old telescope, but I mention them for accuracy, and whilst this is still a practical telescope in both ease of use and performance, its true value lies in its exceptional rarity which makes it a valuable addition to any serious collection. This is an early 20th century, single draw Officer of the Watch Naval telescope signed, 'J T COPPOCK, LONDON'. Of nickel plated brass construction with a stitched leather cladding on the main barrel, it's in good condition throughout, with only a small area of stretched stitching on the leather seam, & some minor dings on the draw tube, see photos. The clean undamaged lenses deliver a powerful clear image of approximately 18x magnification, and there is a protective swivel dust cover in the eyepiece cup, although the separate brass end cap is no longer present. It measures 25.75" fully extended including sunshade, 18" closed, with an objective lens of 32mm visible diameter, and weighs just over 800 grams. A rare example of a 3 draw leather clad field telescope made by Broadhurst Clarkson for the London retailer J A Davis & Son in the 1950's. It carries the Denhill name which was the brand name of J A Davis & Son and derived from the DENmark HILL address from where they retailed mainly binoculars & some telescopes, all outsourced from other manufacturers. Optically sound, and free from any dents, the 40mm visible diameter objective lens delivers a clear focused image of approximately 25x power. Engraved 'DENHILL de LUXE, SPECIALLY MADE BY B C & CO LTD, LONDON' on the first draw, the brass tubes are dent free with a smooth but firm draw action, and retain virtually all their original anti glare coating. Measuring 10.25" closed, 29.75" open, this is a fully functional telescope weighing just under 1kg, making it very practical for regular use. The 42mm visible diameter objective lens delivers a sharp, clear image of approx 15x, and is free from any damage. Ross were renowned for the quality of their telescopes, and it also has the National Physical Laboratory testing logo for the year 1941. The main barrel is clad in a textured black vulcanite finish which has been recoated in places but this can only be seen on close inspection. This particular model measures, 16.5" closed 27" fully extended with sliding hood extended. A great telescope for display or every day use with clear undamaged lenses, and weighing just over 1.3 kgs. A handsome mid 19th century 3 draw marine telescope, engraved 'CARPENTER & WESTLEY, 24 Regents St. LONDON' on the first draw tube. Carpenter & Westley worked at the Regents Street address from 1835, and were best known as manufacturers of Kaleidescopes & magic lanterns, with very few telescopes produced by them, making this a relatively rare example. It has a leather clad main barrel with a filled seam, and three nickel plated brass draw tubes which still retain virtually all of their plating, although there are some areas of rubbing back to brass on the sliding rayshade . The 40mm visible diameter objective glass delivers a clear image of approximately 20x magnification, despite some minor edge chipping on the objective and an internal lens, (see photo) neither of which detract from the viewed image. Despite these blemishes, and the lack of an end cap, the general cosmetic condition is very good, with no dents. It also has a thick sliding coloured sun filter in the eyepiece cup, possibly designed for direct viewing of eclipses or similar, although I would stress that this not something that should be attempted without expert guidance, as improper use can cause serious eye damage. Measuring 33" fully extended with ray shade, 10" closed, and weighing just over 0.7kg, a rare but useable telescope. A nice condition 3 draw leather clad field telescope by J H Steward. Measuring 32.5" extended, 10.5" closed, the 40mm objective glass delivers a bright sharp image of approximately 25x and focuses from around 10 metres to infinity. All lenses are in good undamaged condition, and the leatherwork is also in fine order, including the protective end caps with all stitching intact. The draw tubes are dent free and have smooth yet firm draw action. Originally made for use as a target spotting scope by rifle clubs, it's ideal for every day use, with all the attributes of a good spotting telescope, and weighing just under 1.1kgs. This is a rarer example of the famous WW2 Scout Regiment telescope, signed H.G.P. who I believe was Howard Grubb Parsons & Co, a telescope maker based in Newcastle upon Tyne, and one of the of lesser known makers of this model. Dated 1945 it's engraved ‘TEL. SCT. REGT. MK.II, H.G.P. 1945, O.S.126.G.A. REGD Nr 22337’ on the first draw, it formed part of the No 4T British Sniper Rifle as a target spotting telescope to the scout regiments. The cosmetic condition is very good, in particular the leather cladding on the tapered barrel, and it has clean undamaged optics which produce the sharp clear image one would expect from a telescope with such a pedigree. The brass draw tubes still have a firm yet smooth action, are all dent free, and the eyepiece has a swivel dust cover which incorporates a light filter. It also comes with its original separate hard leather case which is also in great condition as can be seen from the photos, with all stitching intact, and a sturdy shoulder strap. It has a 50mm main objective lens, measures just over 10" closed and 31.5" fully extended including sunshade. The weight is 1.1kgs and 1.5kgs with its case, making it an ideal field telescope for spotting. A fine example of a Naval Officer of the Watch telescope by W Ottway & Co Ltd, Ealing, London, serial no 5217. Manufactured during the 1930's, this telescope is not only visually impressive with its German nickel silver draw tube & fittings, but also delivers a sharp, clear image through the 35mm objective lens. Ottway telescopes were made to the highest standards with all components stamped with the same serial number, and this particular one also carries the National Physical Laboratory testing logo for 1938, along with the war department arrow. The leather cladding is in very good condition but appears to have been dyed black at some point, which is a little puzzling as it is free of any significant scuffs or scrapes and all the stitching is intact, so may simply have been a personal preference by a previous owner, nevertheless it has been done well so doesn't detract. This is an early field telescope by Aitchison who later merged with Dollond to become todays high street opticians Dollond & Aitchison. Dating to the 1920's its in remarkably good condition, both optically & cosmetic. Engraved Aitchison London, 'THE TARGET', No 5739 it's a 3 draw telescope but fitted with an additional pull out pancratic draw tube, enabling the magnification power to be increased from 25x to 40x in 4 stages of 5x. This is a great advantage as objects not clearly seen can be readily observed with the 40x setting. The body is of a tapered barrel design covered in stitched black leather, with matching protective leather end caps and a later shoulder carry strap, all in excellent condition, no broken stitching or tears. Measuring 10.25" closed, 34.75" fully drawn with sunshade extended, the large object glass has a diameter of 55mm which delivers a clear sharp image. The eyepiece lens is further protected by an integral swivel dust cover. The telescope, is fully functional with clear undamaged lenses, and dent free tubes which have a smooth but firm draw action. It weighs just under 1.1kgs and is a great telescope to use for spotting. Made by John Priston Cutts in partnership with George Sutton between 1845 - 69, this is a 4 draw leather clad telescope, engraved 'J.P.Cutts Sutton & Son, Opticians to Her Majesty, Sheffield & London' in a flowing script, on the first draw. Intended for marine use, both the stitched leather clad barrel and the four brass draw tubes are in excellent condition, and it still has its original green tint objective lens which has a 50mm diameter giving a magnification of approximately 25x. All lenses are free from any damage, and the image is sharp, albeit with the distinctive green tint which was intended to reduce reflected glare from the sea. Unusually, the sliding coloured sun filter in the eyepiece cup is 3mm thick and was probably designed for direct viewing of the sun, although I would stress that this not something that should be attempted without expert guidance, as improper use can cause serious eye damage. A large well made telescope, measuring 11" (280mm) closed and 39.75" (1010mm) extended, it weighs just over 1.2kgs and 1.5kgs with its case. Housed in a 2 part leather case which although missing most of its strap cleats & buckle straps,is still quite serviceable, and protects the telescope well. A rare example of a WW2 period ships telescope engraved 'MARINE INSTRUMENTS LTD, LONDON & GLASGOW'. Relatively few instruments carry this name as the company was created by a collaboration between Henry Hughes & Sons & Kelvin, Bottomley & Baird Ltd, after the London Office's were destroyed following the Blitz in 1941, resulting in the establishing of Marine Instruments Ltd. This trading name lasted until 1947 when the formal amalgamation to form Kelvin & Hughes was completed, and Marine Instruments continued to exist but only as UK regional agents for the new company. A single draw design with a long tapering main barrel, this is a powerful telescope in excess of 25x magnification and the 50mm objective lens delivers a very clear well focused image. In very good condition all round the black leather cladding is firmly in place and the stitched seam is intact. The draw tube is anodised brass, as are the fitting including the sliding rayshade, and has a smooth draw action, the eyepiece also has an internal swivel dust cover incorporating a coloured sun filter. A telescope of impressive proportions, it measures 34" fully extended, 25" closed, and weighs just under 1.4kgs. 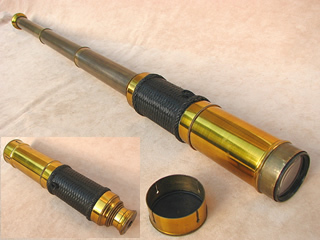 A fine six draw nickel plated pocket telescope dating to the last quarter of the 19th century. Its engraved "BERINGER & SCHWERER, JEWELLERS, FALMOUTH", and measures only 4" (100mm) closed, with the six draws extending to 15.5" (395mm), making it the ideal accessory for using on the move. The cosmetic condition is very good, with all tubes free of dents and although the leather cladding is a later replacement, it is firmly in place. All optics are in good undamaged condition, and the 25mm visible diameter objective lens gives a clear sharp image which focuses easily to a magnification of aproximately 15x. There is a swivel dust slide to the eyepiece, and a separate end cap for the objective. This is a near mint condition 3 draw leather clad field telescope by Broadhurst Clarkson, which appears not to have had a great deal of use, retaining all of its non reflective coating on the 3 draw tubes. This particular model is called the 'Tourist', and is ideal for spotting, being optically sound with a 42mm visible diameter objective lens producing a sharp clear image to a magnification of 25x. The telescope is completely dent free with a leather covered main barrel and all stitching and seams are intact, including the protective end caps. Engraved '25x Broadhurst Clarkson & Co Ltd, 63 Farringdon Road, London E.C' on the first draw, it measures 10" closed 31" open with sunshade extended, a quality telescope in exceptional condition, weighing just under 1kg, and perfect for use on the move. This is a single draw Ships telescope dating to the first quarter of the 19th century by Charles West, who was working in London between 1814 to 1830, and is signed ‘C WEST LONDON, DAY OR NIGHT’ along the first draw tube. A large impressive telescope, it measures 36.5” (930mm) extended, & 21” (530mm) closed, with a mahogany barrel which is in good sound condition, and free of any cracks or splits. The telescope has a segmented draw tube for access to the intermediate lens, and disassembles fully for access to all inner lenses which are in good condition. The main objective lens is the original green tinted glass, has a visible diameter of 40mm which is free from any chips producing a sharp, well focused image of around 15x magnification. It also has a push on brass end cap which is missing its sliding shutter, as does the eyepiece cup, neither of which affects the performance, but please bear this in mind if you decide to purchase. The brass draw tube does have numerous minor dings, but these do not affect the smooth draw action. A very desirable telescope, weighing just under 1 kg, it is in good working order and signed by one of the more prominent instrument makers of the time. A nice example of a Victorian 3 draw medium size mahogany clad telescope engraved 'LENNIE EDINBURGH' on the eyepiece. Made in the second half of the 19th century, either by James Lennie or more likely his widow Eliza who carried on the business after his death in 1857. All lenses are in good order, with a protective brass end cap for the main lens, a dust slide for the eyepiece, and the 35mm diameter objective lens which has a green tint for reduced glare at sea, produces a well focused image of approximately 15x magnification. In very good condition all round, the mahogany cladding is free of any splits or cracks, and the brass draw tubes still have a smooth draw action. A quality telescope, measuring 8" closed and just over 24" extended. A classic single draw Naval Officer of the Watch telescope, made by W Ottway engraved 'Presented By W.OTTWAY & Co Ltd, EALING, 1931' on the first draw. Ottway were renowned for the quality of their telescopes, with each component numbered to the instrument, but this particular example has no serial numbers which given the engraving indicates that it was likely made as a one off for a special presentation in 1931, although the recipients name is not on the scope. Nevertheless as with all Ottway telescopes the quality of both construction and lenses are beyond doubt and the powerful 35mm objective lens delivers a really sharp & clear image of approx 18x magnification. With a smooth draw action both the draw tube and main barrel are free of any dents, and the general condition is good, although the leatherwork is a little faded in places but all stitching is intact and there are no tears or gouges. Measuring 18" closed and 25.5" fully extended with sliding ray shade, these telescopes were specially constructed for Naval use and are very robust, with nickel plated draw tube and fittings, and a swivel dust cover to protect the eyepiece. This is a 3 draw leather clad field telescope by Broadhurst Clarkson with a fourth pancratic tube giving variable magnification of 25x-30x-35x & 40x. Optically sound, the 40mm visible diameter objective lens delivers a clear focused image from 10mtrs to infinity. The leather covered main barrel is in sound condition, with all stitching intact and only some scuffing in places, the largest of which is clearly shown in the larger photos. Engraved 'Broadhurst Clarkson & Co Ltd, 63 Farringdon Road, London E.C' the brass tubes are free from any dents, and the draw action is still firm. The telescope disassembles fully for access to all internal lenses which are all in good order with no chips or cracks. Measuring 10.5" closed, 34.5" fully extended, this is a quality telescope weighing just over 1kg, and very practical for use on the move. This is quite a powerful yet compact spotting telescope combining medium size and low weight with a three stage pancratic tube giving 15x, 20x, 25x magnifications, but measuring only 22" fully drawn and 10.75" closed. Engraved 'BRITEX SPOTTER' on the draw tube, it was manufactured by W. Ottway who reproduced this design under different names including the 'Orion Spotter' & the 'Headquarter & General telescope', mainly on a wholesale basis which is why the Ottway name is not on the scope. Designed for spotting, it's a powerful but compact telescope which is ideal for use on the move, weighing in at just under 750 grams. It has an objective lens of 30mm visible diameter which delivers a clear well focused image, and all lenses are in good undamaged condtion. The dent free nickel plated draw tubes have a nice firm draw action, and there is also a quick focus twist collar where the draw tube slides into the main barrel, for easy deployment. The main barrel has a painted hammer finish and there is a pair of joined leather end caps for protection of both objective and eyepiece lenses. 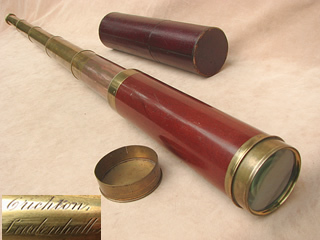 This is a fine example of an early 19th century 2 draw mahogany & brass marine telescope, with the unique feature of a third adjustable segmented tube held in place by a single bayonet collar, for additional magnifying power. Signed 'Richardson London' there is an additional inscription around the first draw which reads: 'Adjustment for Greater Magnifying Power, for Day or Night', and the words 'IMPROVED TELESCOPE' around the large brass collar on the mahogany barrel. There were a number of makers by the name of Richardson, working in London during the early 19th century, and its difficult to pinpoint the actual one, but I believe this may be George Richardson who was active between 1807 to 1830. It measures an impressive 44" fully extended with sun shade, 14.75" closed, and has sliding shutters at each end to protect the 40mm diameter green tint objective lens and eyepiece. It also comes with a rigid hand made leather case for overall protection, and is in very good condition all round with no dents on the draw tubes which still retain a firm action. The mahogany barrel is also in good condition with no splits or cracks. Optically it is very good, with all lenses in clean undamaged condition, producing a clear image of between 15x to 30x magnification. With its' unusual features, it's quite likely that very few telescopes of this design were ever made, making this a rare and possibly important instrument. Weighing 1.3 kgs without its leather case which weighs an additional 0.7kg, the shipped weight will be between 2.5 to 3kg.